The 2011 Drum Corps International Tour begins in just 10 days. It's time to get ready with Dan Potter and DCI Artistic Director Michael Cesario as the two begin their annual preview of this summer's action from last summer's Top 12. 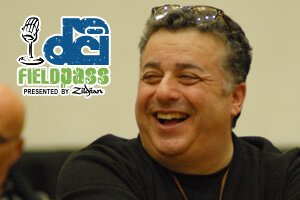 This time it's Glassmen, Blue Knights and the Madison Scouts, in today's Field Pass presented by Zildjian. Download and listen. (MP3, 17:32, 16.3 MB) Have a Field Pass question, comment or request? Leave a message for Dan Potter by phone at 317.275.1212 x40 or by e-mail at fieldpass@dci.org. Subscribe to this podcast through iTunes. Become a fan of the Field Pass on Facebook. Visit Zildjian.com. Field Pass archive.